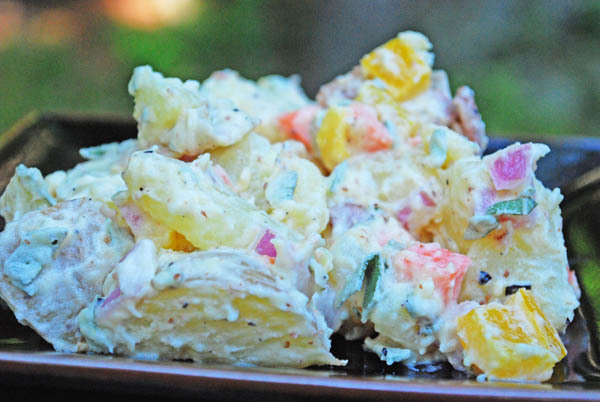 What would a summer barbecue be without potato salad? Okay, I know, summer is practically over. But the calendar never stopped me from firing up the weber and as long there isn't snow on the ground, I consider it barbecue season. Well, despite the ubiquity of potato salad at cookouts across the country, I haven't made any all year.This past weekend, I figured it was about time. Ahead of time, chop your bacon into approximately 3/4" pieces and fry in a saute pan. When the bacon is crispy, remove from the pan with a slotted spoon and set on some paper towels to drain. Set a large pot with salted cold water over high heat and bring to a boil. Wash the potatoes under cold water to get off any exterior dirt, then cut into 3/4" thick by 1"-2" wide-long pieces. Add the potatoes to the boiling water and cook till tender (about 15-20 minutes). Drain the potatoes in a colander and set aside while you make the dressing. In a large bowl, combine the mayo, mustard, vinegar, salt, and pepper. Whisk until well combined. Add the bacon, onion, carrots, and bell pepper. Stir so every thing is coated with the dressing, then add the potatoes and stir well once more. Cover and refrigerate at least one hour. Just before serving, mix in the chopped fresh sage.